(1) Pre-poo and detangling: Before removing the braids I used for my wig, I applied a mixture of lavender JBCO, peppermint, tea tree, and eucalyptus essential oils to my scalp with my Roots Only comb. For my hair, I used a mixture of olive, coconut, and hemp seed oils which I warmed in hot water. I wrapped my hair with cling film and used my heating cap for 30 minutes. The oils softened and lubricated my hair in preparation for detangling . I took down each braid and sectioned it into two. I added more oil to each section and detangled with my wide tooth comb. Then, I braided each section (box/Calabar braids) and tied the end with a rubber band. I had 12 braids in total. (2) Shampoo: I diluted some ORS Neutralizing shampoo in an applicator bottle and applied it to my scalp. Some of the shampoo got into my eyes (ouch) and I rinsed my hair and applied the undiluted shampoo to my scalp. I did a second wash with Crème of Nature Argan Oil Shampoo for my scalp and hair. I was very concerned about getting my scalp clean because part of it was obstructed by the braids. My scalp felt and looked clean. The braids did not unravel; some of the rubber bands slipped off but the braids still held together. (3) Protein Treatment: After rinsing the shampoo, I towel dried my hair and applied Aphogee Keratin 2 Minute Reconstructor all over each braid. I kept it on (uncovered) for about two minutes before rinsing it off. (4) Deep Conditioning: Towel dried my hair for a few minutes and applied Hairveda Sitrinillah over each braid. I covered my hair with cling film and kept it on for 30 minutes with heat. I noticed while I was using my heating cap, some water was dripping out. It seems like my hair needs to be a bit drier before applying the deep conditioner. I thought the conditioner wouldn’t penetrate my hair very well. I rinsed out the conditioner and followed up with an ACV rinse. (5) Leave-ins and Styling: I dried my hair with a t-shirt for 30 minutes to make sure most of the excess water was gone. Then, I applied Giovanni Direct Leave-in and African Naturalistas Leave-in Conditioner to each braid and allowed them to absorb for a few minutes. I took down each braid and applied OGX Nourishing Coconut Milk Anti-Breakage Serum. Then, I detangled with my wide tooth comb. This detangling session was so quick. 😀 When I use sections, the matting will have me detangling for over an hour. I don’t have that time. There was some matting with the braids that were larger. However, it wasn’t nearly as bad as my last few wash days. I blow dried my hair on low heat using a modified tension method. Trust me … this is so much better. This wash day went pretty smoothly and quickly. I didn’t have to spend the entire day battling tangles. I will definitely try this method again but I may do some slight changes. I’m not wearing my wig now. I decided to give my hair a rest from my wigs. 7 weeks is enough. 🙂 I ordered a new one which is coming soon. Currently, My hair is in a bun and I have a lot of new growth. I still haven’t decided if I want to relax my hair. My hair is doing alright now. If it’s not broke, don’t fix it. I need a trim but it’s growing. OMG!!! Look at the length of your hair. I can’t wait to see the full length when you relax. I’m glad your washday went well. 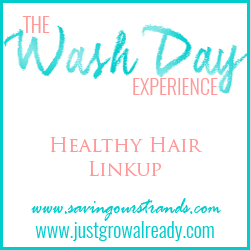 Washing in braids can make a huge difference. Thank you, Hilda. 🙂 Washing in braids may be a game changer. Relaxing my hair is still up in the air but I’ll be sure to keep everyone posted. Yay for the washing in braids win!! Can you describe your “modified” tension blow out method? Thanks, KLP. I use Renice’s (the hairstylist) method with a Denman brush. She has a video about it on YouTube. Wow! I actually watched that video once and I LOVED the technique but I couldn’t find it again on youtube. Thanks for helping me find it again. Glad the washing in braids worked for you. Your hair looks good. sorry about the matting I know how frustrating it is to unmatt your hair! your hair is looking thick, good progress! Love the smoothness of your results! Your hair has definitely grown longer. I’m out of the natural zone. I was afraid of heat damage so I just texturized to blend the textures. Thanks. What texturizer did you use? I’m a bit afraid to relax right now because of my hair line. I used UB but mixed with a tablespoon of oil. I’ll be switching to just for me texturizer soon.